Most wiener dogs have been afflicted by this condition at one time or another. Some dogs outgrow it or learn to live with it but some never recover. It can be a debilitating condition – causing them to not be able to walk – that can interfere with the enjoyment of their life and affect their long-term fitness. Note: the following is satire – a tongue and cheek description of “stubborn” dogs that don’t like to walk in the rain. Although Wet Belly Syndrome is a funny name for the behavior, it is not a serious medical condition. There is no definitive cause of Wet Belly Syndrome but it is suspected that the it has something to do with having short legs and riding low to the ground. It is also weather dependent, often occurring in dogs that live in cooler, wetter climates more frequently. Chester has it. Today we went for a walk. He normally springs into action and runs out the door when I say anything that even sounds like “walk”. However, when his wet belly syndrome flares up it causes him to stop at the door and try to run the other way. I can drag him out the door but my normally speedy dog walks at about half the pace and has to be cheered on the whole way. The syndrome often causes his head to droop and him to look like he has just been punished for chewing a sock. We’ve seen it in other dogs too. We saw it while out on our walk today. We saw a man and his wiener dog ahead of us on the side of the trail. We could tell right away that his dog had Wet Belly Syndrome. The man was looking down at his dog and it appeared he was having a serious discussion with him. The dog was standing there with his head down. The man started to walk across the trail but his dog leaned into the leash and the man practically had to drag him. The man stopped again and as we approached we could see the water dripping off of the dog’s belly. However, if your wiener dog exhibits these 7 signs together, it is likely that your dog has Wet Belly Syndrome. We have been lucky because Gretel has not been afflicted with this condition. Rain, sleet or snow she is up for a walk anytime and is always full of energy. Unfortunately, when it is wet out and we want to walk further than our front porch, or we don’t want to drag a dog for the whole walk, we have to leave Chester home. It means he doesn’t always get the exercise he needs but that is the way it will have to be until a cure is found for Wet Belly Syndrome. 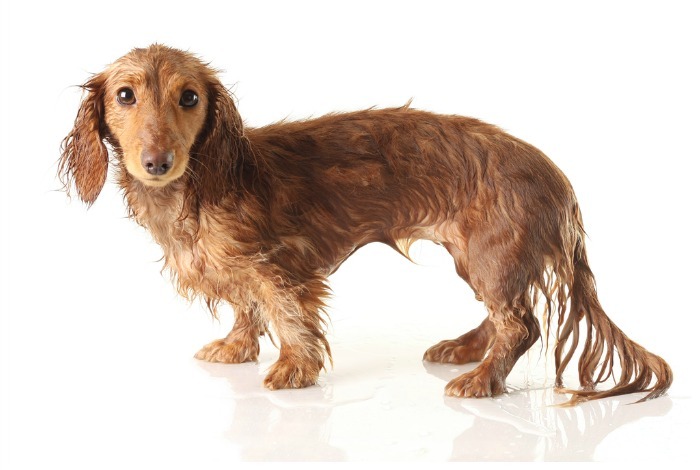 Has your dog been afflicted by Wet Belly Syndrome? How have you managed the symptoms? Is that Gretel in the picture? The only solution I found was a Wet Weather Carry. When the Wet Belly Syndrome strikes, you must pick up the doxie and carry him for his walk. We often performed WWCs during the winter. Ha! I had to carry Chester 3 times in the rain yesterday. He gets heavy and soaks me with water 🙂 It is amazing how much water you can wring out of an almost-hairless Doxie belly! Rex has this condition, I place a fold up dry hand towel underneath his belly strapped by his outdoor outfit, this helps absorb the wetness and he can continue walking. Afterward I take everything off (outfit and wet hand towel) get him dried allowed him to rest and go washed & dry everything. It doesn’t cure the condition, but it helps keep him going and excercising. Ha! YES!!!! Living in NEPA, we’re experienced survivors of WBS. You omitted my favorite symptom, the “white eye stare.” Much like it’s human counterpart, the eye roll, the “white eye stare” is a tilted-head raised eye look revealing the sclera (white part of the eye) that communicates “I DON’T THINK SO” in no uncertain terms. For those not familiar with the “white eye stare”, it is also seen on chilly Monday mornings when you try to wake your dachshund or anytime to try to claim your stake on any part of a couch, bed, or blanket. Oh, yes! How could I have missed mentioning that one? My Greandfather does the “white eye stare” too when we thinks I am doing something crazy. Ha, ha. Uhmmm you did this so seriously that it’s very had to tell you are joking, right? That’s because I have the syndrome, I hate wet grass, sprinklers getting the sidewalk wet ahead of me, or so much as a drop of wet on my head. Diagnosis? Love Dolly PeeS: And my legs are longer than yours! YES! My husband commented earlier today that our spunky girl, Holly, needed four mud flaps to stop her rooster tails when she runs!! He needs a water-repellant raincoat or sweater! You can try spraying a sweater that covers his belly with that new Rustoleum Never Wet stuff. It’s should cause the water to bead right off. Or you could fashion him a “belly sock” also coated with Never Wet to see if that helps. Ugh we deal with this all the time with Leo. Hubby usually has to bring him back home so that he can walk Scrappy and Molly. I do have a picture somewhere of him in snow. the one and only time of him in snow. I have this problem myself and it is not funny, Mom has literally pushed my but up over my ears when it is especially wet! To top it off, she does it when it is white out too, that makes it cold! Aaah, I thought this was just Buster’s personal issue – had no idea it was breed specific! 😉 Well, since I have a Lab who also wants to walk, he sets the pace. I just drag Buster along with lots of perky encouraging words, a brisk pace, and the occasional treat. If the weather is real bad, I take pity on him and let him stay home. We walk morning and evening, and now that he is 10 yrs old, we excuse him from the morning walk most of the winter, but I feel like he still needs to get out and stretch his legs at least once a day. Our doxie Snoop loves the snow, but forget about rain. I am starting to fashion a proper belly wrap with old thick stockings (pantyhose). They fit surprisingly well and cost nothing, I will try and spray them with the water repellant and see if that improves things. However, it’s October and we still have sunny weather over here in Toronto! I can’t complain! Haha, you also forgot about the dreaded “poo strike” symptom! One of my mini dachshunds has this same affliction. I tend to carry him about 1/4 of the way, so he knows there is no going back. He is still sluggish, but not nearly as bad. Ha, ha. That’s one trick. I used to walk a Dachshund that hated physical exercise. The trick there was to carry him away from the house for a while and then put him down to walk back. He was totally into getting back to his couch! Ha, ha. That was just a few blocks though. Sounds like a typical Dachshund. Ha, ha. I’m sometimes not sure which they think is worse – getting wet or being made to wear a rain jacket.